With this recent Lecture with Bryan Alexander he proposed a few different predictions that the future could go in, in the year 2022. 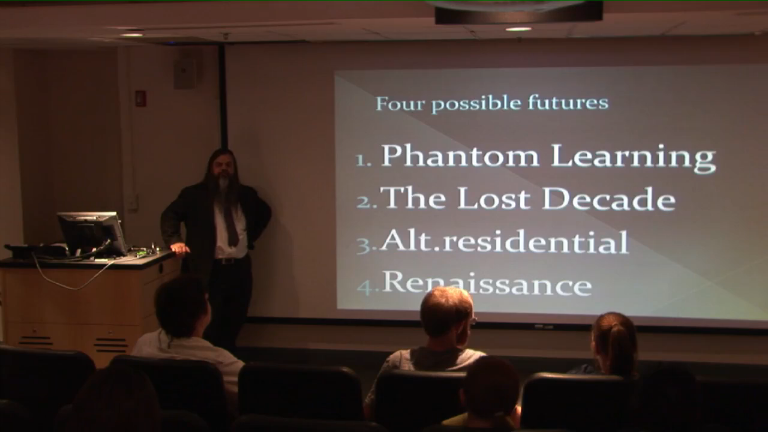 After explaining some research methods Bryan Alexander showed four possible futures, Phantom Learning, The Lost Decade, Alternative residential and Renaissance. They all seem to idealized but I think that of the 4 a Renaissance would be the best of the possible outcomes. perhaps the future just scares me but the way in which all the other possibilities seem so idealized and inhuman, where technology dictates humanity and not the other way around. I think the view of schools disappearing and being replaced with more on-line education scares me in the sense of people not really getting the same education they would be getting in a more traditional atmosphere. Also when things are done on-line, acquiring a degree seems less meaningful, its possible for someone else to do all the work for you without you ever have even done a shred of work. Also It frightens me even in today’s world how cut off people are from one another. A big part of going to school is the social interaction you get from being there and meeting people in person. If you never go to school, and get a job where all your work is done through a computer what do you really DO? Maybe I am just slightly old fashioned in my way of thinking but it genuinely frightens me. I am no exception from the masses of today who mindlessly ogle their feeds on Facebook and what not while touching away on their i-phones and devices instead of interacting with the people around you. I often wonder while I am doing this one thing who am I missing the chance to meet? This is not to say technology and human interaction can not exist together in a constructive manner but the example of phantom learning seems to be so extreme. With the idea of the Renaissance there is room for massive amounts of creativity and always seems so alluring to me as an artist. I do not think that any of the possible futures will actually happen being that they are just predictions but I think they do lend valuable insight as to where we may be headed if you combine them into one view. I might have mentioned before that it makes for much easier reading to use paragraphs in a blog post. I get the sense that you are a bit frightened when thinking about how the future will unfold in terms of the way we interact with technology. I think many of your fears about how an online system can be gamed and abused through fraud are valid. I’m sure the educational institutions are thinking deeply about this. I believe the main part of the blogging activity I requested in terms of Dr. Alexander’s video was for you to imagine yourself living in one of these future scenarios in 2012.